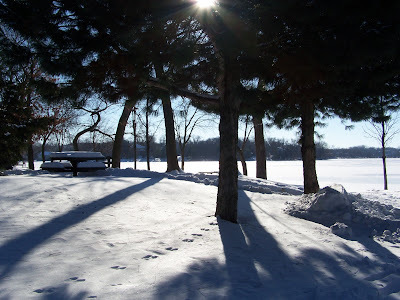 I was in Burnsville recently shopping and thought I would pop on over to Crystal Lake and see how it looked in the winter snow. No one was there and hardly any foot prints were in the recently fallen snow. Needless to say, the sun was blinding off the snow so I used the trees as a filter. Great Image. It's So amazing what snow can do !! !